When it comes to trading platforms, independent traders are literally spoiled for choice with a huge range to choose between. Most brokers offer a range of platform options, often including the ubiquitous MetaTrader 4 or other advanced desktop platforms such as NinjaTrader, social trading platforms such as eToro’s OpenBook and FXCM’s Tradeo, and their own proprietary platforms. These proprietary platforms are either designed in-house or licensed from white-label providers such as Sirix, Currenex, or Saxo Bank, and it is this type of platform we shall be taking a look at today. If we’ve left any out, let us know in the comments box below and we’ll do our best to include them! Avatrade’s own platform is available in three forms – desktop (for downloading to Windows PCs), web (for Mac, PC, and Java-enabled tablets) and mobile (for smartphones and tablets). It’s an easy-to-learn yet powerful platform that enables you to trade directly from charts, using any of over 30 built-in indicators to inform your trades, and also to test and implement auto-trading routines. This basic, online-only platform is compatible with Mac and PC, and provides a range of useful features for the online trader. It’s user-friendly and intuitive interface allows for drag & drop customisation, one-click trading, and a range of real-time technical analysis tools. For those that require more advanced features, the platform can be easily integrated with Metatrader 4, and the platform is also available as an app for iPad, Android, and iPhone. This is a non-proprietary web-based trading platform that is used by a variety of brokers, including Go Forex and Caesar Trade. Because it’s browser-based, you can access it with virtually any web-connected computer or device, and because it is designed to integrate with MT4, it can be the perfect solution for MT4 users who need to access their accounts when they are not at their own desktop computer. As well as full MT4 integration, it offers a number of advanced features of its own, such as built-in risk management and social trading. Investment banking giant Citigroup’s CitiFX Pro trading platform comes in desktop, web, and mobile versions, and combines ease of use with advanced functionality. While the interface is indeed slick and intuitive, it is the ability to tap into Citi’s award-winning research that makes this platform stand out. In addition, the platform offers a full range of stop order functionality, advanced charting, and one-click execution of trades. 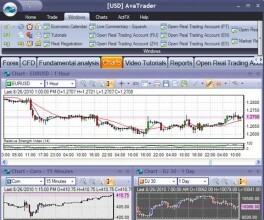 Like many of the more recent entrants to the online trading arena, One Financial Markets has opted to make their own platform a browser or mobile-based effort that integrates fully with MetaTrader 4. These are nothing out of the ordinary, but they are reliable, intuitive, and work well as an adjunct to the more powerful MT4 for desktop computers. This browser-based platform is one of the slickest around, combining ease of use with relatively advanced functionality for a non-software solution. Just about everything you might need to do, from setting trade orders to using technical analysis tools can be achieved just by clicking on the graph. 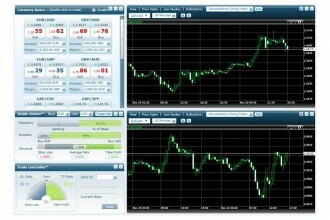 It’s a speedy interface, and there are keyboard shortcuts for every single function to save the trader valuable time. Currenex is a non-proprietary forex trading platform that is offered alongside MT4 by some brokers, including Hantec Markets and Alpari. There are two versions, Currenex classic, which is aimed at institutional investors, and Currenex Viking, which is designed for the independent investor. Both versions are very powerful indeed, with full implementation of scripts and algorithmic trading, detailed accounting and charting features, and fully integrated Straight-Through Processing (STP). While the browser-based version of the platform is the most widely used, there is also a downloadable desktop version and apps for mobile devices running on Android and iOS. 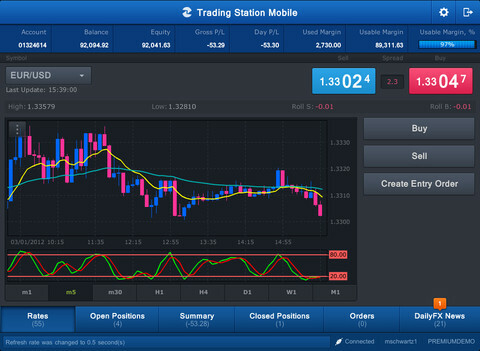 Trading Station from FXCM is one of the most powerful and full-featured proprietary trading platforms for forex. Perhaps its main selling point is the availability of over 600 custom indicators, including fractal-based support and resistance lines, breakout indicators, and automatic Fibonacci/Gan level indicators. The powerful analysis tools allow for the backtesting of strategies, using historical market data, and strategy optimisation using a dedicated tool. There are also browser-based and mobile versions of the platform, but if you want to make full use of all the features, then you need the desktop version. This powerful ECN forex platform allows traders to access deep liquidity from some of the world’s biggest banks, including Morgan Stanley and Deutsche Bank, with No Dealing Desk execution. The interface allows charts to be detached, and snapshots can be taken, which allows for a great deal of flexibility and also easy sharing. Traders can access multiple accounts from within the platform, which is available in desktop, web, and mobile versions. As well as being easy to use, the platform also incorporates some advanced features such as algorithmic trading and a full range of technical analysis tools. This proprietary offering from Forex.com incorporates a number of advanced charting and analysis tools, including Autochartist pattern-recognition, trading signals from eSignal, and a custom-built strategy centre. For those that do not need all the features of the pro version, or are new to forex trading, there is a stripped-down version called FOREXTrader Lite that offers a much simpler interface with fewer features and functions. This new platform from Forex.com differs from FOREXTrader PRO in many ways, offering fixed spreads, instant execution at the screen price, guaranteed stops, hedging, and over 300 currency pairs. There is no desktop version, as it is only available within your browser or as a mobile app. For technical analysis, TRADE offers Market DNA pattern-matching functionality, charting, and a strategy builder similar to that seen in FXPro’s cTrader. This proprietary offering from GFT provides a decent basic trading platform for forex traders, with a fully customisable layout that can be saved for next time, over 85 technical indicators, eight chart types, and a range of timeframes. It’s available in desktop, web, and mobile versions. Easy Forex’s trading platform takes a modular, app-based approach, allowing the trader to customise their layout to suit their trading style. Layouts and apps can be downloaded from the website, which means that you can make it as simple or as complex as you want. A full range of technical analysis tools, news feeds, and advanced charting facilities are available to add to your layouts, combining power with flexibility. As you might expect from a company that provides white-label solutions to some of the biggest names in trading, Saxo Bank’s own trading platform is one of the best in its class. Key features include extensive market analysis, direct communication with Saxo dealers, streaming news, and one-click execution. The layout can be fully customised (on desktop and web versions) and there is also a mobile version for use with smartphones.